My design teams are spread across Salt Lake and Utah counties. I've been purchasing magazines, annuals, and books to build our internal library, but we've had to build up the library in each location or per designer. We've recently moved into a new location and have space to bring in bookshelves and set up a comfortable reading space, but the issue of distance still remains with our south and west studios. 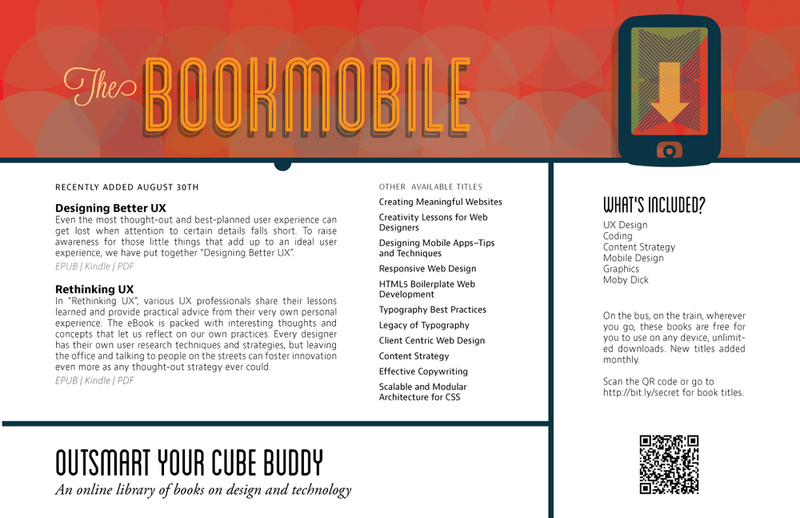 I created The Bookmobile, an online library of design and technology ebooks, to give mobile access to all of our design teams regardless of location. A collection of posters to advertise The Bookmobile. URL and QR code provided for immediate access. I came across an article from Sellbox, an epublisher, on creating corporate lending libraries using Kindles that could be loaned out to employees. The general reason to use a loaning system for devices is because of the limitations of iBooks and Amazon ebooks that can only be installed on 5-6 devices. If the library only consist of these formats, it is more cost effective to provide the device as well as the book to a larger group. Public libraries also use a similar system, but have expiration dates on how long you can keep the book installed on your Kindle or iPad. When the book expires, and you connect to the Internet, the book is automatically removed from your device and made available to other library patrons. Most of my designers have a mobile device, whether an smart phone or tablet, so I didn't create a device check out system. Instead, I have found open formats of books that allow unlimited device downloads. Libraries such as Smashing Magazine's Library, Project Gutenberg, or PDF versions of books, have been the most flexible. As I continue to build the library, I'm exploring subscriptions to online annuals that provide visually rich experiences, but can be distributed at an enterprise level rather than to just one device. I'm also looking into ways to work like a public library, with a check out system for device-limited publications.